Wire sculpture refers to the creation of sculpture or jewelry (sometimes called wire wrap jewelry) out of wire. The use of metal wire in jewelry dates back to the 2nd Dynasty in Egypt and to the Bronze and Iron Ages in Europe. In the 20th century, the works of Alexander Calder, Ruth Asawa, and other modern practitioners developed the medium of wire sculpture as an art form. Alexander Calder (1898–1976), an American sculptor, greatly developed the use of wire as a medium for sculpture with his kinetic and movement based Cirque Calder, as well as pieces such as Two Acrobats, Romulus and Remus, and Hercules and Lion. In 1926, after a stint spent making toys at the request of a Serbian toy merchant in Paris, Calder began creating his Cirque Calder, a miniature, movable circus that uses movable wire models of various circus performers, like sword eaters and lion tamers. After this, Calder created complete pieces only using wire and in 1927 had a show of wire sculptures at the Weyhe Gallery in New York City. In 1930, he had a solo show of wire sculptures in Paris, at Galerie Billiet. Ruth Asawa came to prominence when her wire sculptures appeared at both the Whitney Museum of American Art and the 1955 São Paulo Art Biennial. Asawa learned to use commonplace materials from Josef Albers, her teacher at Black Mountain College, and began experimenting with wire using a variety of techniques. 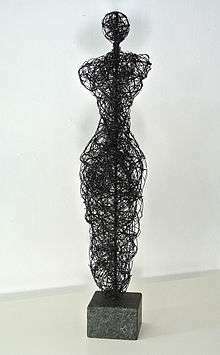 In the 1950s, Asawa experimented with crocheted wire sculptures of abstract forms that appear as three dimensional line drawings. She learned the basic technique while in Toluca, Mexico, where villagers used a similar technique to make baskets from galvanized wire. In 1962, Asawa began experimenting with tied wire sculptures of images rooted in nature, geometry, and abstraction. Gavin Worth has used wire sculpture to combine realistic images with 3-d abstract forms. Worth approached Calder's idea of mobility in sculpture by making the viewer the mobile element. By placing varying images on different planes of the sculpture, the image changes as the viewer sees it from different angles. Kue King has built a reputation combining wire and feather. He sculpts wire using a woven additive technique. Instead of creating form with wire framing, he builds with it like clay. Elizabeth Berrien began working with wire in the 1960s and is hailed as the "Godmother of Wire" by the wave of emerging wire sculptors she inspired. Because the needed tools are simple, wrapped wire jewelry can be learned and performed in home studios by hobby artists. Some of the tools used include pliers, pin vises, file, wire cutters, and mandrels. The wire used may be of a variety of decorative metals in different cross-sections. Wire sculpture jewelry may have beads or gemstones integrated into the design. For most people who start out working with wire it is not cost effective to jump straight to the precious metals such as silver or gold. Therefore, less expensive craft wires made from softer materials such as brass, copper, aluminum, or gold fill can be used. The artist typically first gains experience making with different designs and learning a feel for the wire. There are many ways wire can be handled and wrapped. Progression can be made to the more expensive metals such as 925 sterling silver and 14k gold filled wire. 14k gold filled wire is a tube of 14k gold that has a length of jewellers brass running through the middle. It is not like gold plated wire as there is approx 100 times more gold in gold filled than there is on plated wire. With gold filled wire that is designated 14/20 it means that a minimum 20% of the entire wire is 14k gold. As with solid gold the gold filled wire can come in at least yellow and rose colours enabling the range of jewellery that can be made to be expansive. ↑ Jack Ogden, ‘Classical Gold wire: Some Aspects of its Manufacture and Use’, Jewellery Studies, 5, 1991, pp. 95–105. ↑ Baker, Kenneth (2006-11-18). 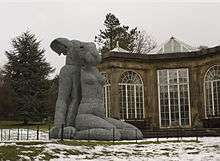 "An overlooked sculptor's work weaves its way into our times". San Francisco Chronicle.